Dwight R.C. 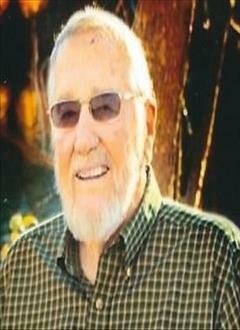 Arndt was born April 11, 1931 to Herbert and Ferne Arndt 3 miles north of Apache. He passed away peacefully April 5, 2019 at his home with his family by his side. Funeral services will be held Tuesday, April 9, 2019 at 2:00pm at the First Baptist Church officiated by Kerry Glasgow. Burial will follow at Fairview Cemetery under direction of Crews Funeral Home. Dwight graduated from Apache High School in 1949. He attended SW State College for 2 years and served in the US Army for 2 years. He and Shirley Crawford were married in 1961, living in Lawton, OK. In 1974, they built and moved into their home in Apache, OK, where Dwight operated his automotive repair shop. Dwight and Shirley sold their home and moved to Prince George, VA in 1985. They lived there until Shirley retired from Ft Lee, VA, civil service, at which time they moved back to their Apache home in 1995. Dwight retired from the automotive field and started raising cattle until 2016. Dwight is survived by his loving wife of 58 years, Shirley Arndt, of the home; his twin brother, Dwayne and wife Vita of Lawton; sons: Terry Arndt and wife Sally of Prince George, VA; Kent Arndt and wife Sheila of Apache; daughter, Debbie (Arndt) Emory and husband Donny of Disputanta, VA; many loved grandchildren: Tina Arndt, Reshelle Claborn, Jenny Arndt, Grant Arndt and wife Lindsey, Jamie Gonzalez and husband Antonio, Jessica Arndt, Jayne Hernandez and husband Ryan, Jason Arndt, Jessica Emory and Marcus Emory; great-grandkids: D’Aysiah Major, Olivia and Ethan Arndt, Ben Brown, Royce and Reyna Hernandez, Chaeli Long, Alejandro Gonzalez, Bailey and Jordan Claborn, Zavian, Emeric, Draius, Kieren, Eliyah, and Avaran Arndt, Jacob Emory, and William Vincent; and brother-in-law, Jim Frank of Cincinnati, OH. ; along with many nieces and nephews. He is preceded in death by his parents, Herbert and Ferne Arndt, sister, Norma Lou (Arndt) Frank, and son, Ricky L Arndt.